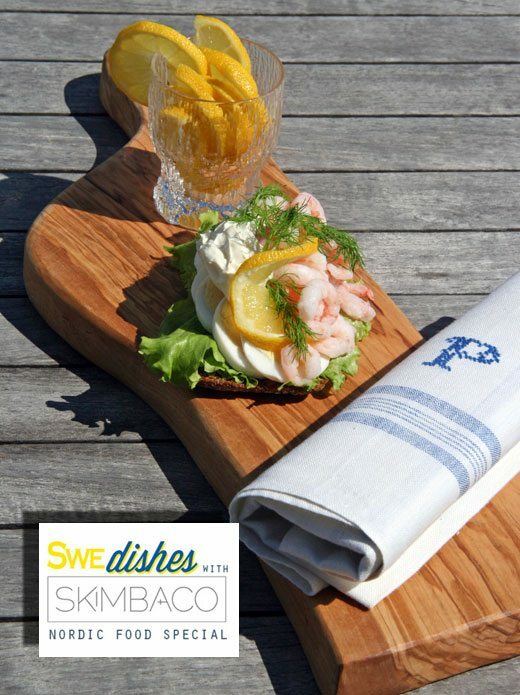 Swe-DISHES with Skimbaco is our new Nordic food special series focusing on bringing you recipes and culinary inspiration from Scandinavia, and my cooking adventures in Sweden. 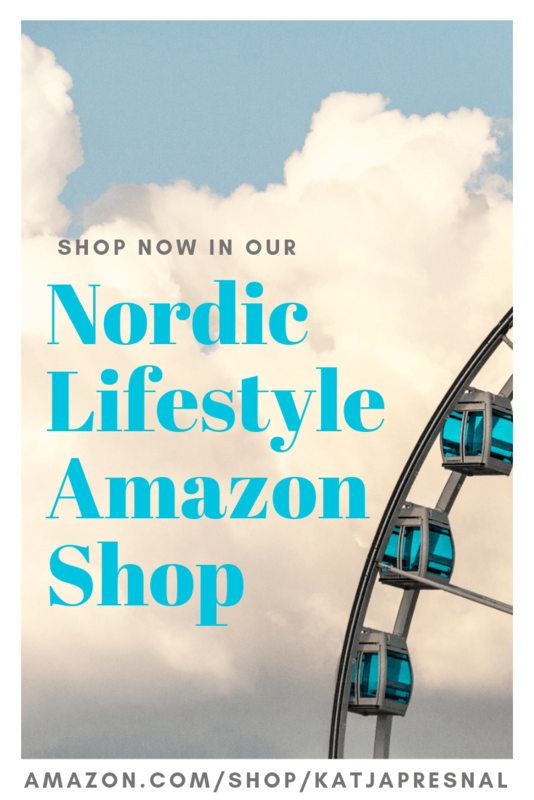 We are kicking off the series with a non-Swedish dish – with a dish Denmark is more known for – a Danish Smørrebrød. Basically Danish Smørrebrød is an open faced sandwich, and it dates to 1840s when workers would take sandwiches to work, consisting of dark rye bread and assorted toppings such as thin slices of cold cut meats, fish, cheese and homemade bread spreads and liver pate. Basically smorrebrod means buttered bread, and like your typical lunch sandwich the Danish kind also comes in several different types. While smorrebrod started as a worker’s lunch, in 1883 the famous Restaurant Nimb in the Copenhagen Tivoli put this sandwich on the menu, and rest is history as they say. Smørrebrød is now known world wide, and regardless it’s long history, it’s actually quite trendy right now. 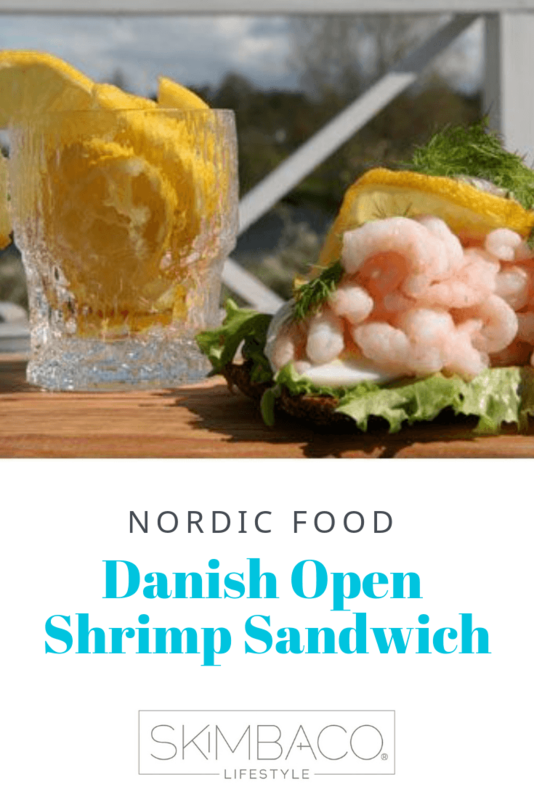 These Danish open sandwiches are easy to make and are great for entertaining, while they are a typical lunch dish, you can also make mini versions for parties. You can find small sliced bread typically in the cold cut meat section at your grocery store, perfect for mini-smorrebrods. You can also add fish like cold smoked salmon for this sandwich. 1. If you purchased fresh shrimp, peel and cook the shrimp, let cool down. I just used frozen cocktail shrimp, it works just fine. Thaw the frozen shrimp in cold water and rinse well. 2. Boil the egg. Let sit in cold water before peeling. Peel and slice. I recommend using an egg slicer. 3. Assemble the sandwich. 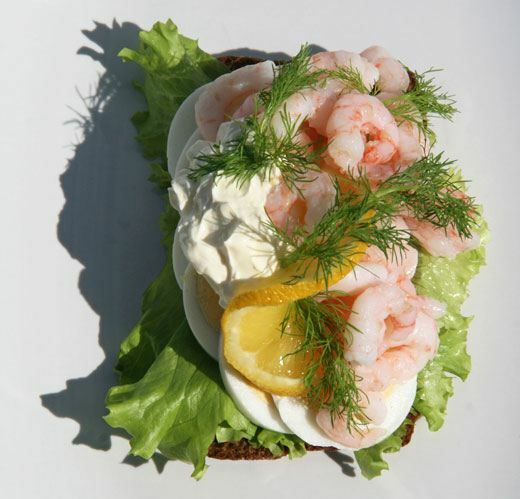 Layer the ingredients on the slice of bread: lettuce, egg slices and shrimp. Add a dollop of of mayonnaise or sour cream and garnish with fresh dill. 4. 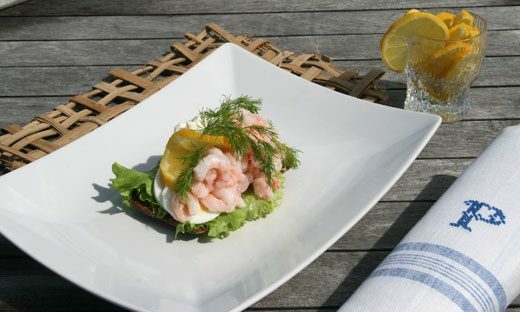 Serve with lemon and snaps, Danish like their akvavit, but as a Finn I say vodka will work as well. 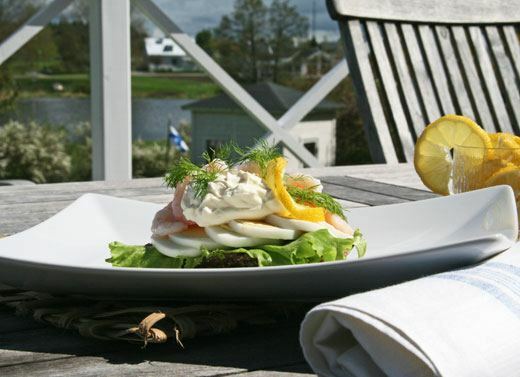 Champagne or dry white wine aren’t bad companions for the Danish smorrebrod either. I was born in Stockholm, fathers parents from Copenhagen, now live in Michigan. These are foods I grew up on and love! All but Janssen’s Temptation, my mother’s favourite at Christmas. Yes – I agree with you! That’s not one of my favorites either! I’m such a huge fan of finger foods from different cultures! One of the great tragedies of my life, though, is that Bob is allergic to rye. I miss it! That looks amazing. The combination of the sour cream with lemon, dill and shrimp sounds so good. I cheat a little… most people use mayo – I like sour cream or Crème fraîche to be exact ;) And I just ate one of these today, they are so good!